Remember the interviews with Yoshio Ishii and Minoto from a while ago? 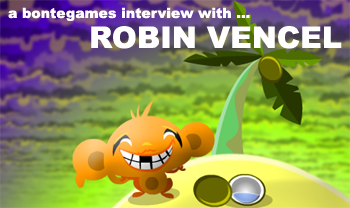 Well, it's time for a third interview with a game designer of the frequently featured games here on bontegames and this time the game designer is ... Robin Vencel! Robin is famous for his Monkey GO Happy series and lots of other Pencilkids games. So put your thinking cap on, submit your questions for Robin in the comments below, I will collect them for Robin and pretty soon I hope to present you everything you always wanted to know about Robin and his games! Wow. Can't think of any questions but it would be great to be able to express my appreciation of Robin Vencel's genius! It always gives a little burst of pleasure to see that a new Monkey Go Happy game is out to see what new challenges I'll be up against. The style and artwork is very distinctive and all the games are always highly entertaining. Pencilkids games is forever bookmarked as a favourite on my browser. Thank you!! Is making games his fulltime job or a hobby? What recent games does Robin enjoy? I've noticed that lately you've been making almost exclusively Monkey Go Happy games, which are great by the way. But have you given any thought to revisiting some of your older game series for sequels, like Bowja the Ninja or Anbot? Or maybe something new all together? Lately you have been striving for one game each month. How do you come up with the ideas for that many games? Also: Do you do all of the work yourself? Or is there a team you rely on (music, art, programming, etc.)? What is your inspiration for the games you create, especially the Monkey Go Lucky series? What inspired you to start designing games? By the way, I'm always so excited when you come out with a new game!!!!!!! Did schooling effect your ability to create art/games or are you self-taught? What three pieces of advice would you like to pass on to others interested in making games? What does he thinks of us grown up bearded folks playing little cutesy monkey games? How did he become a game designer? What led him to designing the Monkey Go Happy Games? Does he own a real monkey? Thanks for all the great questions! Sending them over to Robin now and I'll publish the interview on the blog when the answers are in!